It would be unfair not to talk about these crispy delights and the queues they generate world over - whether it is the southern American fried chicken or the Italian Fritto Misto, the English fish -n- chips, our very own pakoras or the Japanese tempura. 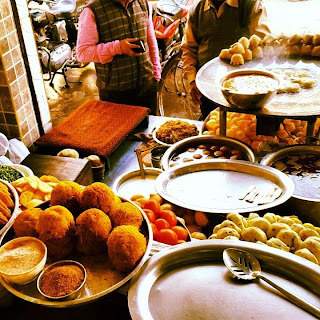 Frying has given us lip-smacking food world over. Being a chef, I am familiar with viscosity and the temperature that hot oil generates to give food the richness, the crunch and a contrast of texture that is otherwise not possible. 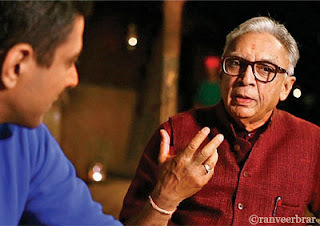 However, to explore frying and its evolution in the Indian context, during my recent travel, I spoke to eminent food historian Dr Pushpesh Pant, and he put things quite in perspective. Fried food allows cooking at up to 190°C. With oven not being a common medium of cooking in India, and water being a source of health insecurity, frying was the only medium to preserve food for a longer time. 'Safri' food or cuisine of the traveller still is pickled delicacies like achaari gosht and fried food like mathris and their kin. Also, Indian festivals and weddings are celebrated over many days, and slow travels to towns and villages in old India meant that eventually the celebration food would take some time to arrive before being consumed. Hence, the high temperature fryer fare was the chosen expression of celebrations in the country. It is unfair to completely negate the relevance of fried food across all food cultures in general and our food culture in particular. This method of cooking has been obsessively targeted as a sole reason for ill health in India, leaving out key details like the quality of fat and the temperature of frying. Being a food tourist, the queues I see at fried food stalls are heartwarming. 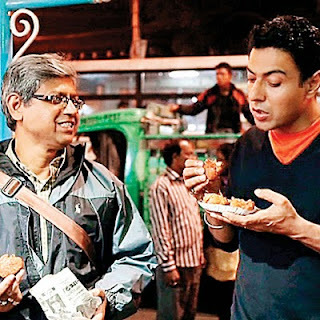 Standing in one such queue for The Great Indian Rasoi in Kolkata on College Street, and craving for hot tea and Tele bhaja, I struck a conversation with the owner Kesto, who is the fourth generation descendant of Laxmi Narayan Shaw, the founder, after whom the shop is named. Kesto showed me pictures of Netaji Subhash Chandra Bose eating at the shop, passionately speaking about how the modern fat food cannot replace the neighborhood addas, while I enjoyed my raisins-stuffed soy chop and piyaji. Keshto proudly told me that they have been serving free Tele Bhaja to north Kolkata on January 23 (Netaji's birthday) ever since 1942 when LN Shaw went door to door distributing Bhaja. Sit in your living room window with hot tea and pakoras, eat less but eat for sure, because sometimes, nothing beats good fried food. Travelling to eat has many advantages, especially if you are a chef; the biggest being the chance to meet some really passionate people who have been around food for generations and look at their dishes as an extension of their family. Gujarat is full of such people, and eating around Ahmedabad I met quite a few. I cannot do without naming Surendra Patel of Vishala, who has one of the world's largest utensil museum, besides the restaurant that is born out of the sheer need to cook prasad for the small temple nestled in the vast expanse of the restaurant. Mr Patel strongly believes that food is a giver. He says it has given him the passion and the life force that his original occupation of interior designing and architecture couldn't. Having fed heads of state in his restaurant, he humbly dismisses his achievements as a gift of food. All his food is cooked without onion and garlic and he serves the best Undhyu I've eaten. Other gifted gentlemen I met in Amdavad were from the seventh and eighth generation 'farsaan' families and 'halwai' families. 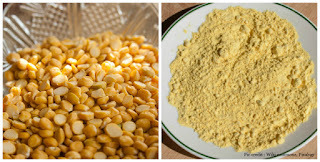 I believe in a strong relation between cultural aspects like people, traditions, food and its ingredients, and one ingredient that encompasses the headstrong yet humble,resourceful and varied culture of Gujarat is the Chana Dal - a lentil that has been around for 4,500 years in India. It grows in the most adverse conditions, and yet is humble enough to lends itself towards preparations of all kinds and all courses ranging from starters and snacks (like farsaan) to mains (undhyus, gattas and other innumerable preparations), accompaniments (papads) to desserts (Mohanthal and other vast variety of sweet besan preparations). This nourishing grain, which has been the food of the Harappa civilization and beyond in India for me truly exemplifies grit, resourcefulness and adaptability of a great culinary region in India. 1. Make the batter of soaked rice and dal with warm water, add curd to it and allow to ferment for six hours. 2. To make the mixture; in a bowl add the rice and split black gram batter, boiled beetroot paste, finely chopped coriander and gram flour and mix. Leave for 30 minutes. 3. Grease another bowl with oil and pour the mixture in it. Place the bowl in the steamer to let the mixture steam. 4. In a pan add oil, sliced onions, ginger juliennes, finely chopped green chilli, sesame seeds, curry leaves, french beans, water, salt, sugar and vinegar and let it reduce for two minutes. 5. Remove the prepared dhoklas from the steamer and cut into long pieces. Place it on a plate and add some of the french bean mixture. Add some more dhoklas and keep the leftover french bean mixture. 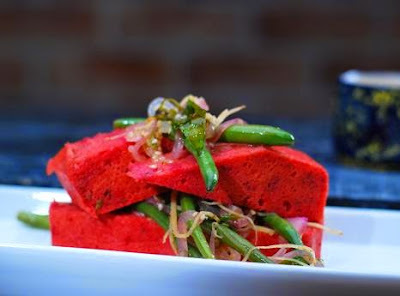 Beetroot Dhokla is ready to eat.